"Arribada" is a Spanish word meaning "arrival." This term is used to describe the nesting phenomenon of the ridley turtles, which appear to hold a meeting off a specific coastline and then decide simultaneously that the time is right to lay their eggs. 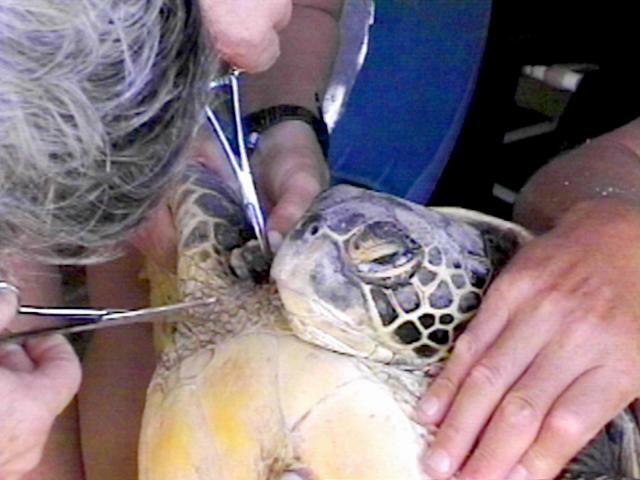 Thousands of female turtles can be involved in an arribada. At Honokowai, we experienced an arribada this week, and it was both rewarding and exhilarating. Oh, the turtles didn't arribad or anything but it was an "arribada" nonetheless. The first one to scramble up our beach was George Balazs of the National Marine Fisheries Service in Honolulu. Soon he was accompanied by Marc Rice of the Hawaii Preparatory Academy, and Denise Ellis, George's dive partner and colleague at the NMFS. The time they spent with us was as intense as it was important in our scheme of things. Until now, the turtles here have had pretty much just the two of us. We did the video, the photos, the writing, the fussing and fretting, but our efforts were amateur--except for the fussing and fretting. We're pros at that. All this time the honu have had to content themselves with our limitations. This week we got some idea what it must have felt like to see the U.S. Cavalry come charging up over the hill. We're still euphoric over what happened during the six dives we had with George and his crew. We learned so much! Regular readers might recall that we wrote about a new problem we are seeing here at Honokowai: a type of barnacle we nicknamed Clingons. George tentatively confirmed that the barnacles, which we'd reported to him earlier in the summer, were the same ones he'd seen only three times before, and only on dead or "near-dead" turtles sent to him from Maui. The honu not only cooperated with George and Co., it was almost as though they were volunteering their services! Some turtles we'd rarely sighted showed up so George could have a look at them. For example, 1998 Turtle 28 appeared after a lengthy absence. George captured it and examined the animal's overall health--it was poor. For some reason none of us could determine, the turtles chose the first two mornings of George's visit to feed in large numbers in the shallow waters just two or three condos north. While we've often seen a few heads popping out of the water there in the past (no more than half a dozen), on these mornings they seemed to be holding a convention. Later, we started a dive by snorkelling up to that area to see if we could determine what they might be eating. To our untrained eyes, the bottom seemed to be mostly the seaweed Acanthophora, which we've seen juveniles eating from time to time. Naturally, we figured that's what they'd been after. George, however, has analyzed the stomach contents of many Maui turtles and he almost always finds that they've been feeding on a different seaweed: Pterocladia. The mystery was solved when Denise picked up a fuzzy lump and shook it. Underneath she found--Pterocladia! Much to our delight, we got many lessons like this one crammed into two and a half days. We were left exhausted but happy, and George, Marc, and Denise have our sincerest gratitude. It's clear from our farewells to George and his colleagues that they enjoyed their Honokowai experience and that they love these honu too. We told George frequently how sweet and beautiful and big Honokowai grows the greenies. From his up-close and personal look at them, we know he also thinks these honu are cool. On Wednesday, George and his crew captured Polzbarney with our help (we showed them where to look). We videotaped and photographed the capture, but as soon as they got her onto dry land, we were having a tough time dealing with it all. We both said it felt like betraying a friend, even though our brains told us it was the right thing to do... that other turtles would benefit from what George might learn about Polzbarney's disease. When we heard George say, "...mouth tumors", our eyes reddened and tears welled. We then hugged each other and broke down and cried, since we knew how devastating mouth tumors usually are. George, Marc, and Denise examined her, took tumor biopsies, and inserted a PIT tag. While we tried to photograph and videotape the procedure, there were times we had to stop and let out some more tears. Our good friend could do no better than to be in the gentle and expert hands of George Balazs and his assistants. We knew this and were very happy Polzbarney was getting that kind of caring. George, Marc, and Denise examined him, took tumor biopsies, and inserted a PIT tag. Still, to see this special little friend that we've seen since 1995 on her back and out of her element was as distressing for us as it probably was for the sweet honu. All three of us are over it now. Peter and I feel only satisfaction. Polzbarney returned to her home ledge by the next day and demonstrated no fear of us--although she seemed a bit more cautious than she'd been before she was grabbed. Her prognosis is not as bad as we first feared. Although there were small mouth tumors, they are not yet impeding her breathing or ability to feed. We fervently hope that they never will. 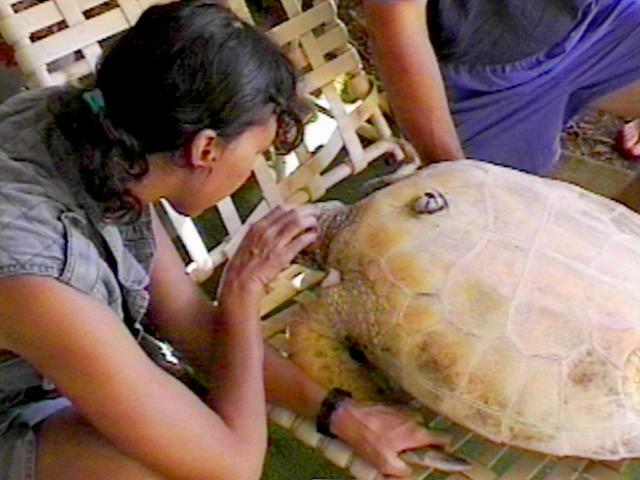 On behalf of Polzbarney, 1998 Turtle 28, and ourselves, we'd like to take this opportunity to say mahalo nui loa to George, Marc, and especially Denise for the compassionate and gentle way they treated the "landed" Honokowai honu. As we were putting the finishing touches on this week's update, we received the following from a friend of the turtles. We often get similar email, but this one is kinda cute and it seemed to put a nice finishing touch on a wonderful week, so we thought we'd share it with you. My name is [K. R.] I love sea turtles! I think it is very sad that sea turtles have to suffer for our polution!! If I were older than 11, I would love to help and make sure any animal wasn't hurt. Well got to go!! Bye!! !